You did a great job and we do not know how to thank you for that wonderful 31 minutes which will give back the memory of our wedding day many years later. Every single minute is perfect, the small details, for example the necklace on my neck. I do not know how did you manage to cut it so well. The beginning of the movie makes me cry all the time, it is so nice when Szabi first sees me. The whole family, every event and all the moments are captured in the film. For us it was such a nice and happy day, and thanks to this film we can experience everything again after many years. We really like the music, each frame, it is really like we are. Thank you for that and thank you on behalf of our whole family. We wish you lot of beautiful, exciting and rewarding weddings, I wish every bride to have such a nice wedding day as we had and to have such a perfect wedding film as we have. Probably, it is an occupational hazard, but I also watched the film using a lumetri scope and it was fantastic… Our wedding video turned out great and we could not be happier! I am so glad that we asked Erika and Zsolt, the professional wedding cinematographer duo, to capture the best moments of our wedding. They are a friendly young couple, who are very passionate and do a great job together. We simply cannot thank them enough for the professional wedding film they made. Whenever we watch our wedding film I feel a shiver down my spine. 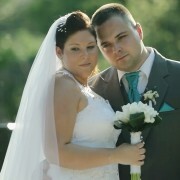 We would definitely recommend Erika and Zsolt for anyone looking to capture the special moments of their wedding.